Treat them right and you’ll have fuchsias in bloom almost all year round. Whether they are grown in containers or the garden, manure and moisture are the secrets. Fuchsias need their roots to be kept damp and it is no accident that of our four native species, kotukutuku (F. excorticata ) thrives along streams and tiny F. procumbens does better in partial shade. In all, there are about 100 species of fuchsia most from central and South America. The first to be recorded by Europeans was F. triphylla , found in the Caribbean in the late 17th century but they had been around for aeons, as demonstrated by a fossil found in New Zealand late last year. It was dated to the Early Miocene period of 20 million years ago, when we had just broken off from the great southern landmass, Gondwana. As plant collecting boomed in the late 18th and early 19th centuries, more fuchsias were introduced to Northern Hemisphere gardeners and with the increase in numbers, hybridisation began to flourish. F. triphylla , which was immensely popular because it flowered almost all year round, was one of the foundation species in breeding programmes. The emphasis has been on impressive flowers that make them ideal for containers and hanging baskets, while the hardier, small-flowered types are sometimes seen as hedges in warmer climates and tall varieties lend themselves to being grown asstandards or espaliers. Fuchsias vary in hardiness and even the so-called evergreen “toughies” will drop their leaves in frosty conditions, while tender varieties will die. If left until spring, some that appear to have succumbed to winter’s chill will regrow from the base but in cold climates it is wiser to grow them in containers that can be moved to a sheltered spot before the cold weather arrives or cover the root area with mulch. Outdoors, grow fuchsias in a sheltered spot with moist, rich soil. White varieties need full shade. Feed plants well with sheep pellets and blood and bone when planting and again when pruning, usually done in late autumn or winter, although it can be left until spring. In early summer, give each plant a teaspoonful of potash to give better flowers. Potash does not give more flowers but improves the quality. Keep well watered in summer and give an occasional feed of liquid fertiliser. Fuchsia flowers are usually white, pink or purple, although salmon-orange tones – for example in ‘Lord Lonsdale’ – are available. Variegated leaves give additional interest to some varieties. Most blooms droop but those of native groundcover F. procumbens are upward-facing with bright blue anthers and are followed by long-lasting pinkish-red berries. F. procumbens ‘Variegata’ has mottled green and white leaves. The National Fuchsia Society of New Zealand (www.nzfuchsia.co.nz) is the national body for various fuchsia societies throughout New Zealand, as well as independent members in New Zealand and throughout the world. The society maintains a register of all fuchsias grown in New Zealand. 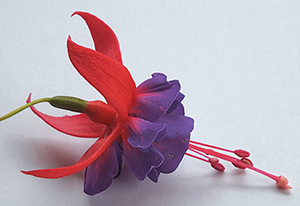 A fuchsia flower has six main parts. The petals (purple in this example) are surrounded and protected by sepals. There are usually four sepals but double varieties may have more and F. procumbens has none. Behind the flower head is the tube, the same colour as the sepals, which protects the greenish-red ovary, containing the seed. The stamens have filaments-like stalks tipped by pollen-covered anthers (the male part of the flower), while the protruding pistil is comprised of a stem-like style, tipped by the stigma (female part), which becomes sticky when ready to be pollinated. Fuchsias are easily grown from cuttings. Take woody pieces (hardwood cuttings) when pruning then either root them in water to which some rooting hormone is added or in damp pumice or potting mix. Soft cuttings can be taken during the growing season – just pinch out of the bush a piece a few centimetres long, trim off surplus leaves and grow as with hardwood cuttings. The fleshy berries are popular with birds, especially native tree fuchsia (F. excorticata). All types are full of seed, so save some to try propagating your own varieties.